Sitting down, his polite words were almost as powerful as a threat. Nie HuaiSang finally started his explanation. Wei WuXian made an “oh” sound. He silently exclaimed, What a case of waking the sleeping lion. Nie HuaiSang, “For an event as big as building a tomb, no matter how cautious and discreet one can be, it’s impossible for everything to stay hidden. The grave robbers pried into the matter and firmly believed that there was a huge tomb from past dynasties in the Xinglu Ridge. They planned this out a long time ago and came prepared. Among the unruly group of people, there were actually one or two who had true skills, allowing the mob to locate the orientation, pass the maze array, and find our saber tomb. They’ve seen enough dead people in their lives, so, after digging a hole and entering the tomb, they weren’t really scared of the corpses. But they searched everywhere for gold and treasures, breathing next to the corpses, and, even worse, they were youthful men in the prime of their lives, filled with yang energy. Remember, the corpses lying inside were all about to transform! “It wasn’t hard to figure out what happened. Ten-or-so corpses transformed immediately. “However, these grave robbers weren’t average people. With a complete set of tools, they actually managed to somehow kill the walking corpses once more. After the fight, there was flesh and blood all over the ground. They finally realized that the tomb was dangerous and got ready to leave. But, just as they were leaving, they were eaten! “The number of corpses put in the tomb was strictly controlled. It was neither more, neither less, just enough to be at a balance with the saber spirits. It would’ve been fine if the grave robbers caused just the transformation, since, after they left, the saber spirits would’ve suppressed the transformation again. But, with the chaos they caused, the corpses were all cut to pieces, and so there were suddenly a few less corpses than it began with. For the saber tomb to ensure that there were enough fierce corpses and sword spirits to suppress each other, it… it could only… close itself off and trap them inside the tomb for the group to make up for the shortage they had caused. “Since the saber tomb was destroyed, the sect leader at that time began to think of different methods. He chose another spot on the Xinglu Ridge and built a saber hall instead of a saber tomb. In case grave robbers came again, he hid the corpses inside the walls in disguise. Wei WuXian took the stone. After having a better look at it, he found something white that protruded from the stone. It looked like… the bone of a human’s finger. Or else, seeing from the QingheNie Sect’s half-dead situation right now, if this was released to the public, Nie HuaiSang would become a sinner, a disgrace to his ancestors even if he died. It was only natural that he’d rather be the secret laughingstock of all the sects instead of focusing on cultivation or daring to sharpen his saber’s blade. If his cultivation reached a certain level, he would gradually become more irritable and, in the end, die with anger the same way that his brother and ancestors died. Even after his death, his sword would haunt the living and disrupt the peace of the whole sect. If so, being a worthless person even seemed better. It was quite an unsolvable problem. Ever since the founder of the Nie Sect, this had been the same. Surely it didn’t mean that the future generations would have to deny the path and basis that the founder forged? All of the cultivation sects were skilled in different areas. Similar to how the GusuLan Sect was skilled at music, the violence and power of the QingheNie Sect’s saber spirits were how it outshone the other sects. If it abandoned its founder’s ideal and started anew in search of a different path, who knew how many years it’d take, or if it’d even succeed or not. 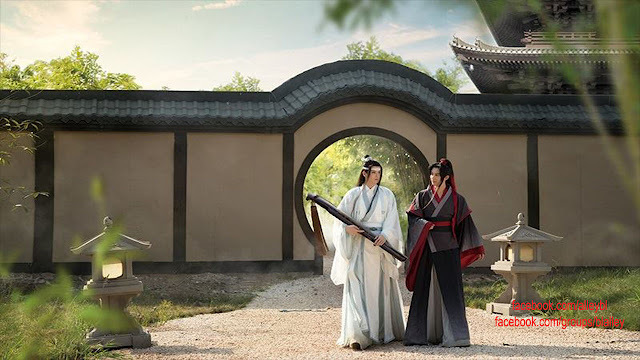 Moreover, Nie HuaiSang would never dare to betray the Nie Sect and cultivate a different path. Because of this, his only choice was to be a good-for-nothing. If he weren’t a sect leader and spent his whole life the same way as he did back in the Cloud Recesses, fooling around for entire days, he’d certainly be in a more comfortable position than he was now. But, since his brother had passed away already, no matter how hard it was for him, he’d still have to take the responsibility on his shoulders and stumble forward. Transform: This refers to the turning of a normal corpse to a “walking corpse” or “fierce corpse”. If anyone calls this process “zombify” or these corpses “zombies” (such as the translator of Daomu Biji), I will send knives to their house. Sleeves: In Ancient Chinese clothing, there were openings inside of sleeves for storing things.